We're all for safe co-sleeping here at Inhabitots, but we do know that bringing Baby into your bed doesn't always come easy. Some babies are simply bed hogs - moving around in their sleep and able to take up much more space than you've ever imagined. And it's that active lil' snoozer that inspired these comical "Baby Sleep Position" graphics from the brains behind How to Be a Dad, a humor blog for parents. Keep reading to laugh off your co-sleeping stresses. While some of the baby sleep positions drawn by How to Be a Dad such as “The Neck Scarf” aren’t so common – most of you probably haven’t woken up to find your baby lying across your face after all? But you’ll likely find others to be all too familiar. “Snow Angels” for example, might remind you of your uber active baby flailing his arms and legs, causing you and your partner to hug the edges of the bed. Or, the dreaded H. How to Be a Dad co-founder Andy says, it was one of the first ideas he and other co-founder Charlie bounced around even before the site was launched. “The H position seems to be ingrained into parents. Into our lower backs and stomachs at least,” he says. 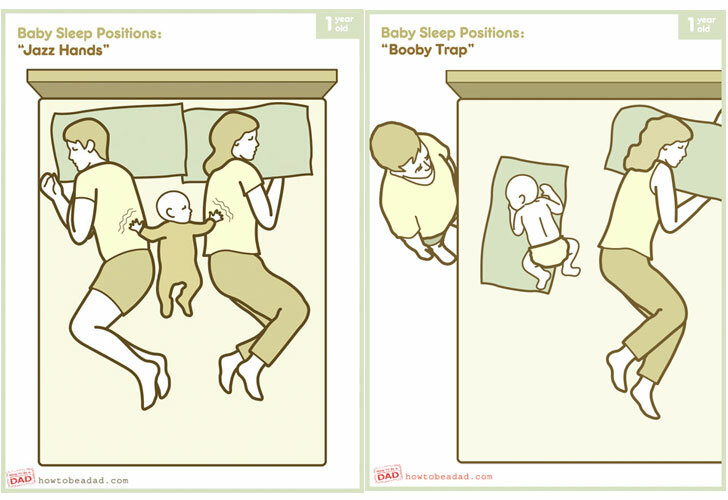 Of course, we’re not sharing these humorous graphics to discourage co-sleeping. If you need help overcoming any co-sleeping hurdles, we have tips to help you. But if you have any funny baby sleep positions of your own, please share them in the comments below. I'm very familiar with all of these positions - unfortunately even the "Neck Scarf"! And the "Dreaded H" and "The Stalker" are very common ones in my bed! Thanks for sharing these awesomely funny graphics! This is hysterical. My husband and I just had a great laugh looking at all of these diagrams because they are so very true. Yes, even neck scarf. I LOVE the titles of each picture -- this dad has truly been there, done that. We have a gigantic bed for co-sleeping, but it seems the tiniest body always commands the most space. Funny. While some of the baby sleep positions drawn by How to Be a Dad such as "The Neck Scarf" aren't so common - most of you probably haven't woken up to find your baby lying across your face after all? But you'll likely find others to be all too familiar. "Snow Angels" for example, might remind you of your uber active baby flailing his arms and legs, causing you and your partner to hug the edges of the bed. Or, the dreaded H. How to Be a Dad co-founder Andy says, it was one of the first ideas he and other co-founder Charlie bounced around even before the site was launched. "The H position seems to be ingrained into parents. Into our lower backs and stomachs at least," he says. Does you baby do the "Donkey Kong" to show you who rules the bed? Or does your little one perch between your pillows and watch you sleep at night? Of course, we're not sharing these humorous graphics to discourage co-sleeping. If you need help overcoming any co-sleeping hurdles, we have tips to help you. But if you have any funny baby sleep positions of your own, please share them in the comments below.